I hope everyone enjoyed my DIY Halloween Costume Guest Blogger Series! Today’s blog is a bit of a surprise. It ends up one of the lovely ladies from the “Rock Paper Scissors” costume I included in my post, Tuesday Ten: Creative & Crafty Halloween Costumes, is a LaurenConrad.com member! As luck would have it, Courtney Richards (aka “Scissors”) offered to provide everyone with a step-by-step tutorial on how to recreate the fabulous costume trio she made with her friends! Below are Courtney’s instructions… If you have any questions for Courtney, feel free to message her on her LaurenConrad.com account. Happy crafting! Hi everyone! Courtney here. For the past couple years, while my friends and I were in college, we always strived to have super creative costumes for sorority and fraternity theme parties and, of course, Halloween. Some of our past costumes (together and separately) included: the “Monday, Tuesday, Wednesday girls” from the Nuva Ring commercial, the “balloon boy” from the popular 2009 scandal, a PB&J sandwich, post-it notes and more! For us, the brainstorming of Halloween costume ideas starts as early as a month to two months ahead of time. For the Rock, Paper, Scissors costume we knew that we wanted a group costume to suit 3 people. 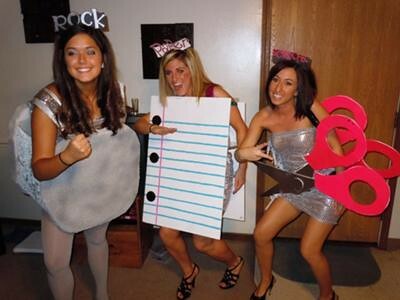 We Googled “things that come in threes” to find inspiration, and voila: The Rock, Paper, Scissors costume was born! The Rock, is an Illinois Elementary School teacher named Lauren Miller, Paper is also an Illinois School teacher named Kierstyn Hacker, and I am the Scissors, an Industry Events Manager from Chicago. Enjoy the tutorial! 1. Cut the fabric to a length you prefer. 2. Wrap the fabric around you until the piece meets at both ends. 3. Cut fabric in half so that each cut is on your side. 4. Extend the fabric about 3 inches on each side. Cut strips into each side of the fabric where the sides met. These strips should be about 3 inches long and 1 inch wide. 5. Once all of the strips are cut, tie the sides together (it is easiest to tie the sides together when you are wearing it). This process looks similar to tying fleece blankets. 1. Cut the foam into two large, uneven circles. 2. Spray paint the foam circles to look jagged. 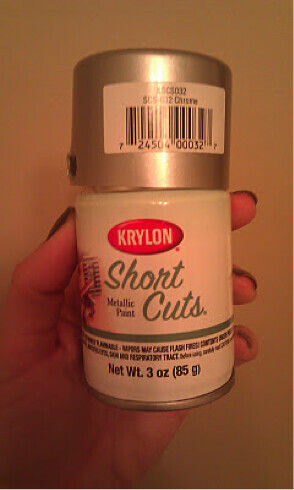 (To the lighter make it look jagged, spray it entirely color first, then take the darker color and accent it). 3. Spray with sparkle spray paint at the end. 4. 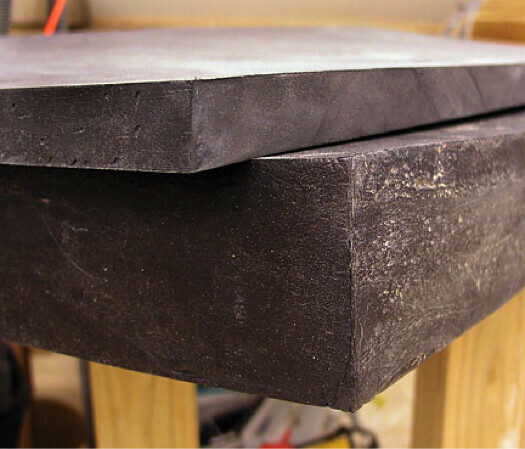 Once the spray paint is dry, cut out two velvet pieces to hot glue on each side of the rock. The length of the velvet will vary depending on the person. 5. Glue additional sequin straps like suspenders. 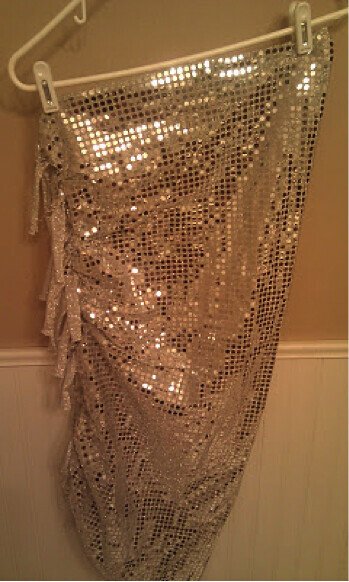 Elastic sequin strips work really well! 1. Hung like suspenders, the “paper” costume is made from a giant white foam board, which can be bought at Hobby Lobby (or any office or craft supply store). 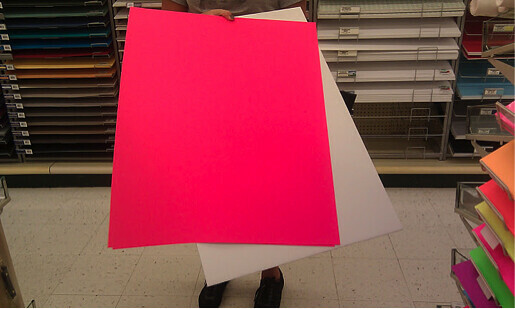 You will need two white foam boards, one for the front and one for the back. 2. 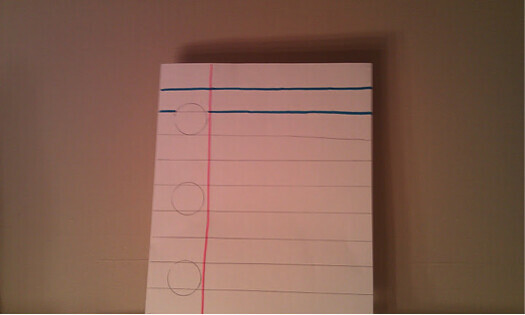 On the front of the board paint with a light pink color, horizontal stripes and one thick light blue stripe vertically on the left (so it looks like a sheet of ruled paper). With black paint, create 3 circles to represent hole punches vertically on the left. Do this twice, once for the front and once for the back board. 1. 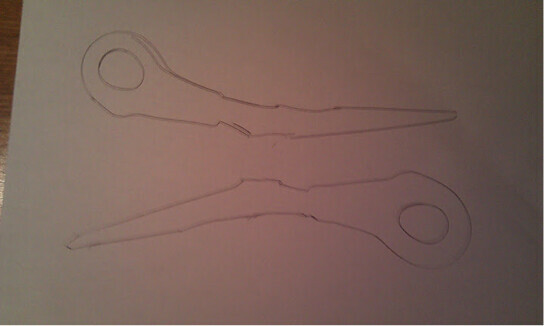 Scissors: To start off, use a pair of regular scissors as reference to draw an outline of a pair of scissors on the white foam board. You will create two complete pairs of scissors, one for the front and one for the back. Do this two times. Using a box cutter is the easiest way to cut out your shape after its drawn on the board. Use a hot glue gun to combine the sides of the scissors. 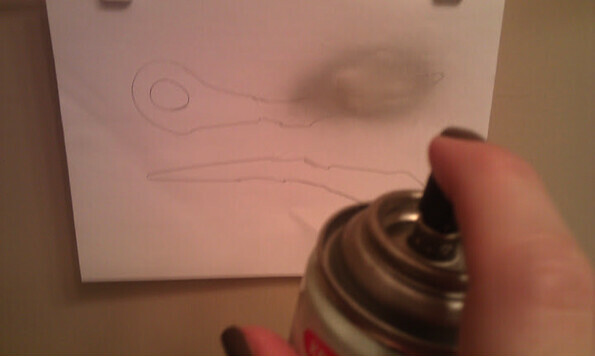 Spray paint all sides of the scissors with the silver spray paint. 2. The pink handles: For the pink handles trace the outline of the scissor handles on the pink poster board. Cut out and glue to the to the silver scissors. 3. Once the two separate scissors are made, make them mirror each other when you’re wearing them. It’s easiest to create the handles when the scissors are on your body. 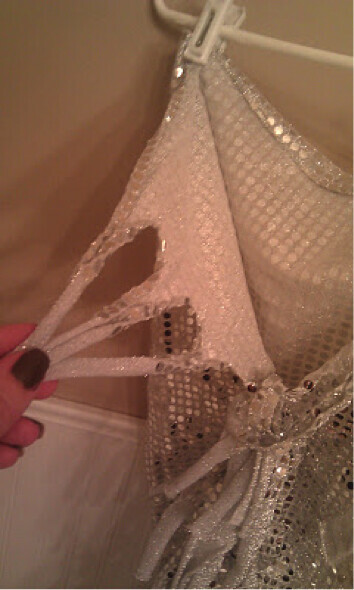 Glue the sequin straps across the inside of the scissors like a guitar straps. 4. 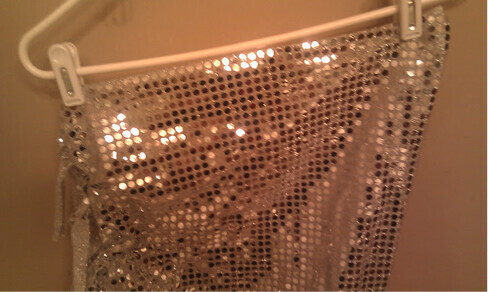 Glue additional sequin straps like suspenders. 5. When you are finished you can add cute gems and jewels to the corners of the scissors and the handles! 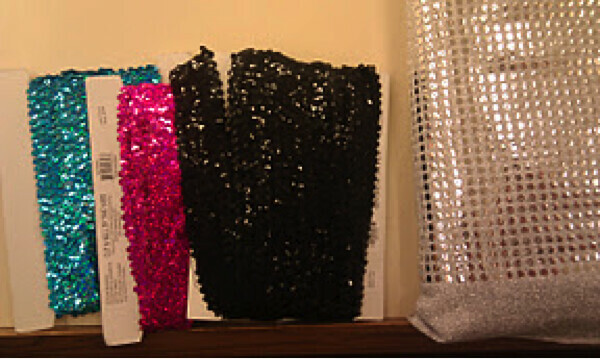 To make them extra girly, use the sparkle spray paint generously! The sparklier the better! Are you going to make this costume?